It is a deep yellow overall, and one distinguishing feature is that the antennae and legs are all yellow. Total length 20 mm. Thorax dorsal shield black with two long and wide longitudinal yellow stripes, expanded anteriorly, and yellow patches laterally; anteo-lateral plates yellow rimmed with dark centres; posterior plate orange-brown with posterior yellow bar. Waist mainly yellow, with black lines. Abdomen anterior yellow, 2nd seg red yellow with fine black band, remainder yellow with black bands. Wings yellow; length 15.0-16.5 mm. Legs yellow-brown (male - inner seg. with black). Prontum with a fovea; mesepisternum with a dorsal and a epicnemial groove; muscle-slit of propodeum broad; pleuron with weak and ill-defined, sparse punctures; male genitalia with the digitus bearing a wide submembranous sac which is not longer and narrower then the sclerotized basal part. Polistes olivaceus builds a generally round, flat nest, which is usually suspended from a solid, sheltered surface, or hidden in dense foliage. This is another adaptable species which is not averse to nesting near human habitation; nests are very often found under window ledges or even more unusual locations such as inside cabinets and discarded air-conditioning units. The colony usually attains far larger sizes than most other local Polistes, usually in the range of 60 wasps and sometimes exceeding 100. - Richards, O.W. 1978. The Australian social wasps (Hymenoptera: Vespidae). Australian Journal of Zoology Supplement Series, 61: 1–132. 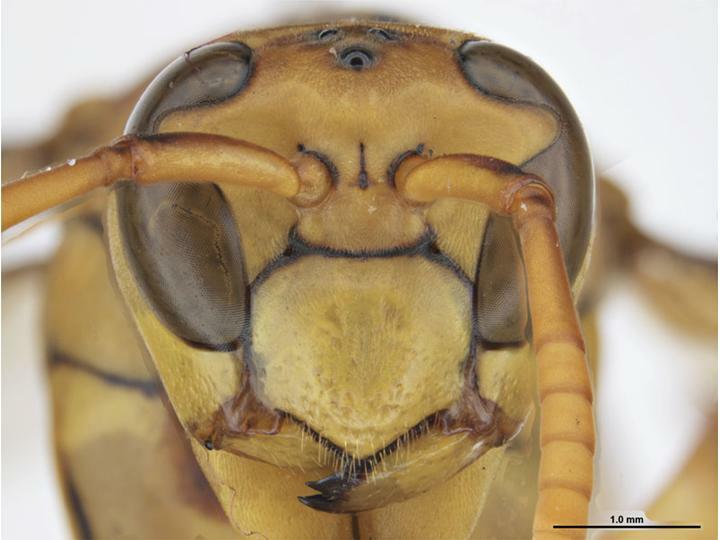 McCaffrey, Sarah & Ken Walker (2012) Macao Paper Wasp (Polistes olivaceus) Updated on 3/8/2012 3:28:10 PM Available online: PaDIL - http://www.padil.gov.au.